Comedian/writer/producer Larry Wilmore, “senior black correspondent” for the Emmy Award-winning “The Daily Show with Jon Stewart,” will visit the Newhouse School on Wednesday, Feb. 12, as part of the school’s Leaders in Communications 13th Annual Conversation on Race and Entertainment Media. He will take part in a Q&A with Charisse L’Pree, assistant professor of communications, at 7:30 p.m. in the Joyce Hergenhan Auditorium in Newhouse 3. Follow on Twitter at #CommsLeaders. 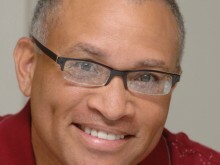 Wilmore is considered one of the most important satirical African American journalists in the United States. On “The Daily Show,” he adds his own unique comic perspective to the reality-based look at news, trends, pop culture, current events, politics, sports and entertainment with an alternative point of view. Wilmore has been nominated for and received numerous awards, including an Emmy, a Peabody and Humanitas, TV Critics and NAACP Image Awards. His first book, “I’d Rather We Got Casinos and Other Black Thoughts,” was published in fall 2008. He will sign copies of the book following his talk.